At Brewer Family Dental, we love helping our patients replace missing teeth. Not only does it allow them to enjoy their favorite foods again with ease, and help preserve their oral health, but it brings back their sense of happiness and confidence when they can smile and laugh without embarrassment. Porcelain bridges are a fantastic tooth replacement solution if you are missing a tooth or multiple teeth. Porcelain bridges are tooth replacement appliances than can replace a single or multiple teeth. The tooth or teeth being replaced will be anchored to the surrounding teeth with crowns to provide support and stability, and restore them to health if necessary. If you have a tooth or multiple teeth that are broken, cracked, missing, or otherwise damaged by decay or injury, a porcelain bridge might be just what you are looking for to restore your smile to its beautiful form and function. 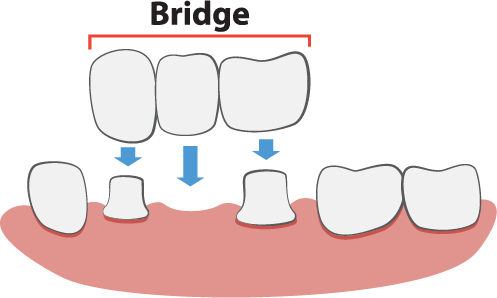 Benefits of porcelain bridges range from cosmetic, to health, to functional. Made out of tooth colored porcelain, and crafted using our high-precision technology, bridges restore your smile to its full brilliance, and blend in seamlessly with your natural teeth. No one will know you’ve had a restoration (except for you and Dr. Brewer, but don’t worry, he won’t tell). Bridges also help preserve the health of your mouth in many ways. When left untreated, missing teeth can compromise the stability of surrounding teeth, allowing them to move or rotate, causing discomfort. It can also affect your bite, and the health of your jawbone. Restoring your smile with a porcelain bridge will help keep your smile healthy. Missing teeth are not only unsightly and unhealthy, but can affect your ability to enjoy your favorite foods and carry out your daily life as you did before. Replacing teeth with a dental bridge allows you the freedom to eat, speak, chew, smile, and laugh again with confidence. If you are curious about what a porcelain bridge could do for you, please contact Dr. Brewer, your Lexington dentist at Brewer Family Dental today with questions or to schedule a consultation. Call (859) 554-4799.